Warning: I wrote this blog in 2014. That is a long time ago, especially on the internet. My opinions may have changed since then. Technological progress may have made this information completely obsolete. Proceed with caution. Determine the first date that will be displayed on the calendar. Determine the last date that will be displayed on the calendar. Now when you look at the calendar, the most obvious thing is that there is a week with only one day. 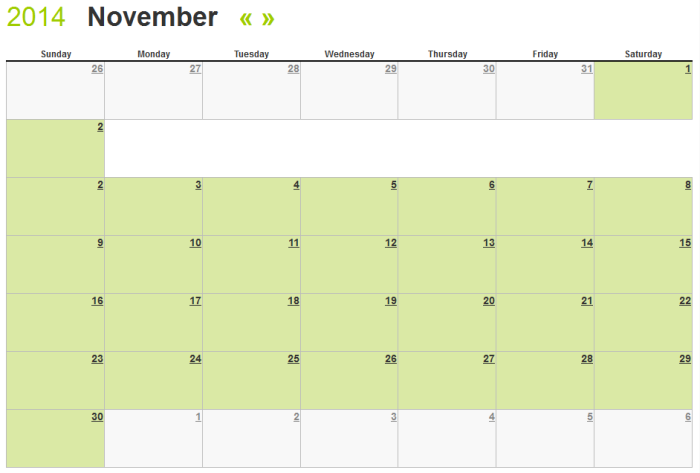 But the real problem is that November 2 is on the calendar twice. What I forgot when initially coding this is that a day is not always twenty-four hours! If you observe daylight saving time, there is one day a year that is only 23 hours long (the day you “spring forward”), and one day that is 25 hours long (the day you “fall back”). When I create a date, but don’t include time, it gets created with a time of 00:00:00 (midnight). So when I add 24 hours to November 2, 2014, I get 11pm on November 2, 2014, not midnight on November 3, 2014. The fix is pretty simple: instead of adding 24 hours, add one day. The language already is smart enough to account for daylight saving time when you do this. Site and content © 2015-2019. All rights reserved.